“awesomely deranged Punk Blues trio” The Guardian. You can download CLKW from here, buy on Amazon or The Hut. Sweet Jane, Often in our thoughts but always in our hearts. 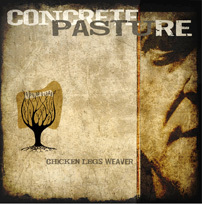 Andy Weaver recorded “Concrete Pasture” in March/April 2010 in Wray’s Garage, Hayes, Middlesex. With Al Manning taking up his role in co production/drums and percussion, the result is a stripped down and intimate but raw collection of new songs and covers. Concrete Pasture is currently awaiting widespread distribution. The latest Chicken Legs line-up (Al Manning on Drums and Chris “Big Hands” Mason on Bass) will appear at The Load Of Hay, Uxbridge on 4th March 2012.